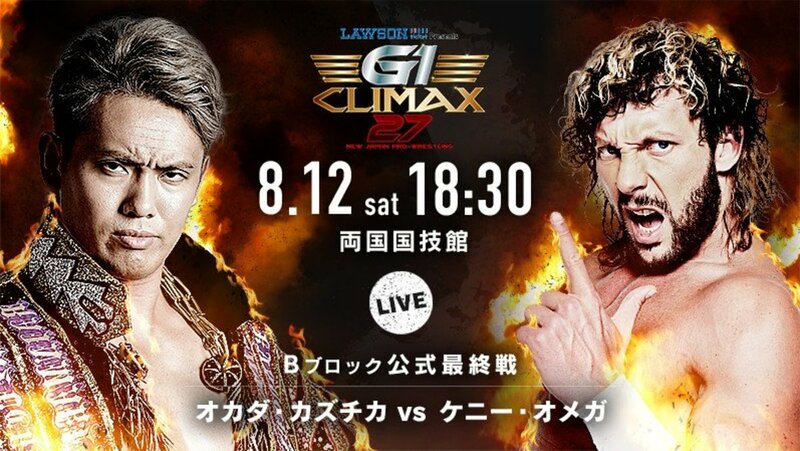 The third encounter in perhaps the biggest rivalry of the year is set to take place at Sumo Hall this morning as Kazuchika Okada and Kenny Omega face off in the B Block finals of the G1 Climax. They are the only two left in contention at this point. Okada has the edge heading into the match as following his draw with Minoru Suzuki, he has 13 points to Omega’s 12. Okada can advance with a draw, but Omega needs to pin Okada in order to make it to the finals. Other B Block matches tonight include Michael Elgin taking on Juice Robinson, Tama Tonga squaring off against SANADA, Minoru Suzuki trying to outwit Toru Yano, and Satoshi Kojima facing EVIL. Join us this morning at 5:30 a.m. ET for live results. The show will have English commentary available with Kevin Kelly, Don Callis, and Rocky Romero calling the action. Liger got a hot tag early and looked great, dominating and laying out all three members of Suzuki-gun. KUSHIDA and Desperado went at it as well, since they are having a title match somewhere down the line. They teased an encounter before the G1 shows, and Desperado has picked up a multitude of wins during these last 17 shows. Kawato came in and had Desperado in the Boston crab but Taichi and Kanemaru came in to even the odds. Desperado followed through with the Angel’s wings for the win. Desperado blasted KUSHIDA with the IWGP Jr. after the match. This was a good back and forth tag team match. Owens came in and nearly had the package piledriver on Goto. He fought back, hit the ushigiroshi and followed with the GTR for the win. Heels took Nagata and Makabe to the outside. Iizuka blasted Makabe with a chair. Mostly just an okay match. Iizuka is just as good as you remember him being; what that entails is up to you to decide. He used the iron fingers to blast Nagata, then Sabre followed with a penalty kick for the win. There was a fun spot early where Rowe took out half the Bullet Club with back breakers and gut busters. Fale came in for the save, and what do you know, Rowe can’t do what he just did to the other members of the Bullet Club. Young Bucks, Page and Cody all went for the moonsault but Taguchi Japan cut them off. They piled up Bullet Club and had Hanson go on top but Fale came in for the save. Everyone came in for spots, eventually leaving most of Bullet Club out of the ring. Ricochet came flying first with a twisting Sasuke special. Hanson followed with a somersault to the outside. Kitamura hit the ropes, but Page came in with a clothesline, then followed with the rite of passage (Omori driver) for the win. This was a really good match. Nothing fancy or anything, but there were a few really great spots and the finish was nice. If there is one person in this tournament who should have higher stock following the G1, it’s Juice. Elgin wiped out Robinson on the outside with a big somersault to the floor. Robinson made a pretty good comeback. He laid out Elgin with a DDT but ate an enziguri as he hopped off the top rope. Robinson caught Elgin with a full nelson slam for a two count. Robinson captured Elgin as he was going to the top rope and landed a powerbomb. He motioned for the pulp friction, but Elgin escaped...only to be caught with a gutbuster. Robinson went for a somersault into the corner, but Elgin grabbed him and gave him the buckle bomb. Robison quickly came back with a flash cover, but Elgin kicked out. Elgin went for a burning hammer, but Robinson escaped and hit a big punch. Elgin reversed the pulp friction, but Robinson met him with another punch and finally got the pulp friction for the win. Robinson wanted to shake hands after the match. Elgin obliged, then left as Robinson celebrated. This was fine, not much to talk about. Just a nice back and forth match. SANADA and Tonga showed great agility towards one another early. SANADA got the advantage and put Tonga in the paradise lock, leading to Tanga Roa and Yujiro Takahashi to come in for some help. Roa made himself helpful by taking out SANADA on the outside with a lariat. Back in the ring, Tonga hit a gun stun and also hit a twist and shout neckbreaker. SANADA escaped one gun stun attempt, but then walked right into another for the win. Suzuki jumped Yano immediately at the bell and took him to the floor. Taichi, who was seconding Suzuki, jumped into the fray. He took him back to the ring. Yano managed to undo a turnbuckle, but Suzuki mostly dominated. Yano gave Suzuki an atomic drop on the outside and tried to tape Suzuki’s legs, but it doesn’t work. Instead, Suzuki ties up HIS legs. He puts Yano in the sleeper. He started to argue with the referee as Taichi came in with a chair. Rocky Romero, who was on commentary, came in to make the save. Suzuki took him out as Yano came with some tape. Suzuki fought back, but did eventually get wrapped up in tape, got low blowed, and was pinned with a roll up. Suzuki was incensed about the loss, attacking every young lion he saw after the match with a chair and fumed to the back. Kojima gave EVIL a bunch of chops in the corner and hit the elbow. He went for a roaring elbow, but EVIL fought back. Kojima blocked EVIL’s attacks and hit a koji cutter, then laid him out with a giant DDT on the apron. EVIL managed to catch Kojima in a waistlock and landed a German suplex, then followed with the darkness falls. EVIL did a throat slash, motioning for the STO but Kojima fought out of it. He kept no selling EVIL’s lariats until he busted out one of his own, taking out EVIL. Kojima followed with a brainbuster. He went for one more lariat and countered EVIL’s attempt at an STO. EVIL, however, headbutted Kojima and followed through with the STO, securing the win in a very nice back and forth match. Yes, I can confirm that this was better than their other two matches -- well, at least in my own opinion. While those matches were amazing in their own right, I honestly can’t think of how you can have a better 20-25 minute match like this one. Once again, both Kenny Omega and Kazuchika Okada have demonstrated what a big time pro wrestling is in 2017, and it's pretty damn amazing. They start off with guns blazing as Omega immediately went for a V-trigger. A very exciting minute of action ensues as Okada gets Omega on the top rope and dropkicks him to the floor. Omega throws him into the barricade, then lands a big boot that sends him to the floor. Omega hits a giant running crossbody, sending them crashing onto a row of chairs. Okada hits the elbow and the rainmaker pose. Omega immediately took him to the floor and hit a big crossbody to the outside. Okada smashes his neck against the guardrail. Omega took Okada back to the ring and made a point to score a missile dropkick right in the back of Okada’s neck. Omega continued to work on the neck, looking for a piledriver but Okada countered with a back body drop. Omega fired back with a rolling senton. Okada got the knees up with a moonsault attempt, but Omega countered with a hurricanrana and a dropkick to the neck., but Okada came back to the ring and hit a flapjack. Omega tried for a springboard, but Okada dropkicked him, sending him to the floor. Omega countered with a reverse rana to the floor. A doctor and some other officials checked in on him. Omega would have none of it continued the attack, hitting a dragon suplex on the apron and lifted him up with a knee neckbreaker...but Okada kicked out. At the fifteen minute mark, Omega continued the assault, hitting Okada with a v-trigger square to the face. Okada started to get angry, grabbed Omega’s knee and started to fight back, hitting a tombstone. Omega took him to the top rope and went for a fisherman’s buster but Okada sent him back to the floor, then delivered a big dropkick to the back of Omega’s head. Omega hit a v-trigger again as they did more back and forth, but Okada fought back with a German suplex. Omega hit a big time uranage, but Okada was able to fight back with a rainmaker, only for Omega to kick out at two. Omega hit a backslide, but Okada hit another rainmaker and held on to the wrist. Okada hit another, then went for one more but Omega ducked and hit a German suplex, then another. Okada fired back with elbows, but Omega neutralized him with a reverse rana. Omega went for the One Winged Angel, but Okada tried to escape, so he transitioned it into the Croyt’s wrath. Okada came back with one more dropkick and went for the rainmaker but Omega countered, grabbed the wrist and landed a v-trigger. He finally hit the One Winged Angel and pinned Okada to not only beat Okada for the first time, but also to win the B Block. Omega cut a promo in Japanese before going into his match with Tetsuya Naito tomorrow. Naito, as well as Los Ingobernables de Japon, is so good and so popular. The problem is, however, everyone here is wearing Bullet Club, Kenny Omega and Elite shirts. He will win and become the first ever two time gaijin winner of the G1 Climax.